Jerri Graham, owner of “Nothin’ But,” a small company based in Westport that makes all-natural, hand-crafted bars. She calls them premium snack bars -- not "granola." They may be a blend of oats, nuts, fruit and honey, but don't call them granola bars. "This is Westport," joked Jerri Graham. "These are premium snack bars." Graham is the owner of "Nothin' But," a small company based in Westport that makes all-natural, hand-crafted bars. On a recent Friday morning, Graham is busy mixing up a batch of Chocolate Coconut Hazelnut bars and talking passionately about her product. "People have this perception of the `Granola Lady,' " she said. But she certainly doesn't fit the stereotype of a laid-back hippie selling nuts and twigs. Instead, this young, energetic woman is on a mission. "I have a big overarching picture of what I'd like to do. I'm trying to exalt these bars to another level. The next Starbucks or Dunkin' Donuts." She points out that, in the bars you can see each individual nut, oat and coconut flake. "I like to feel different textures when I'm eating," she said. "I'm not a mother bird. Each bite should be a different pop or zing in your mouth." Fairfielder Neil Dewar said he first learned about Nothin' But bars at the Fairfield farmers' market in July. "I had just come in from a group bike ride with Trifitness club, which was then in the Brick Walk. After 30 miles, I was ready for a healthy, nutritious breakfast and got exactly what I wanted at the market. Jerri offered me samples of all the bars on sale that day and I loved the Fig, Date and Tahini bar." Graham said she has countless flavor combinations for her bars. "Oats are like a blank canvas," she said. In fact, traditional Scottish oat cakes were part of her inspiration. 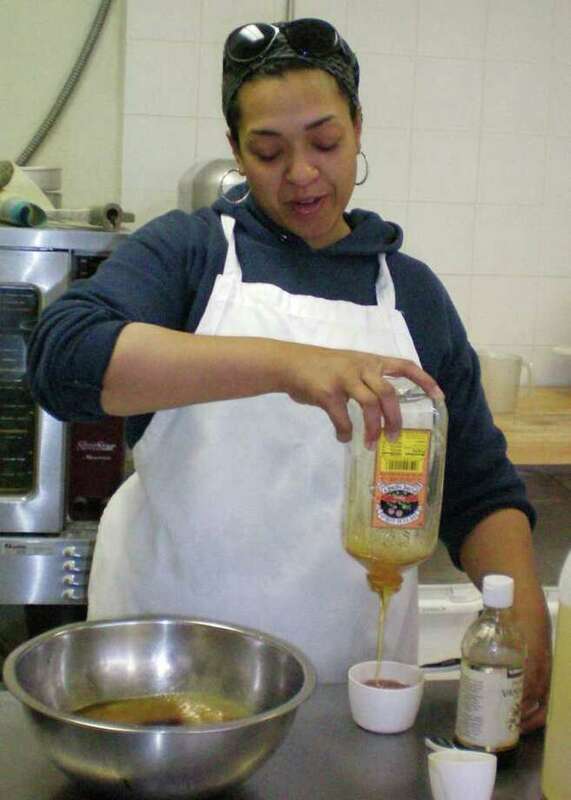 She started with one basic recipe and then used her intuition to develop other flavors. "I think of places I've lived," she said. Her Ginger Lemon Cashew bar was inspired by time living in Taiwan. Another flavor she's made was Wasabi Pea with Ginger and Cranberry. "Food should be something surprising," she said. One of her most popular bars is Cherry Cranberry Almond, which contains four different types of almonds, dried cherries, hemp and organic oats. While Graham loves what she does, she points out that she's had challenges along the way. "It's not as easy as I thought it would be," she said. "But it's very soul satisfying. I always thought I'd be writing the Great American Novel, not creating a snack bar empire." A big part of what she likes about the business is the interaction with her customers. "At the farmers' markets, I can talk to people. I want to be interacting with them." That's what attracted Dewar to her kiosk at the farmers' market. "Jerri makes the bars in small batches and is continually experimenting with new varieties," he said. "She brings samples of trial batches to the market and asks customers if she should adjust the ingredients. When were you last asked if the recipe in a product is just right? The recipes are all innovative, and unexpected ingredients make these bars special." Graham will be selling her bars at the indoor farmers' market at Gilbertie's in Westport (7 Sylvan Lane) throughout the winter, and they're also available at Doc's Café (570 Riverside Ave., Westport). But her big news is that she'll be taking her show on the road. She recently purchased a cute little trailer that she'll be towing around Fairfield County, selling her bars along with hot oatmeal and granola with Greek yogurt. "I'm sick of America running on crap doughnuts," Graham wrote on her blog, "so I've decided to step in and bring oats to the world." She'll be Tweeting her locations so fans can easily find her. For more information, visit www.bbbars.com.